Dubai is the master of creating cities dedicated to specific industries, with Motor City, Sports City, Internet City and Media City among the most established. Now, government-owned Dubai Holding is set to launch a city dedicated to food. The AED5.5 billion ($1.5 billion) Dubai Food Park at Dubai Wholesale City will house all categories of food-related services. The objective of the project is to enhance Dubai’s position as a regional hub for food trade and re-export of foodstuffs, facilitate access to new markets and global investments, and support food security in the UAE. “Dubai Food Park has been established to meet the growing demand from the food sector in the UAE and the region, triggered by population growth and the development of the tourism sector,” explained His Excellency Abdulla Al Habbai, chairman of Dubai Holding. Dubai Food Park was recently launched by His Highness Sheikh Mohammed bin Rashid Al Maktoum, Vice President and Prime Minister of the UAE and Ruler of Dubai, in the presence of HH Sheikh Maktoum bin Mohammed bin Rashid Al Maktoum, Deputy Ruler of Dubai. The 48 million-square-foot project is located close to Dubai South and 10 minutes from Al Maktoum International Airport and the Dubai Expo 2020 site. It will provide a range of government services under one roof to help food-related companies grow, reduce supply chain costs and foster innovation. These services will include customs, clearance, licensing and food safety and supervision. 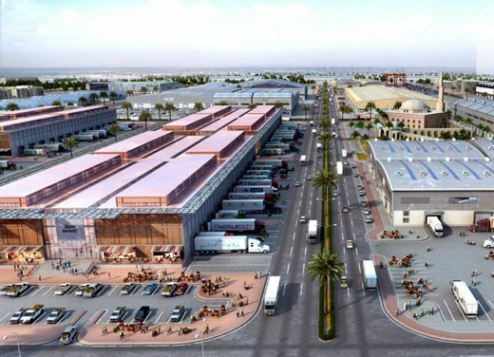 Dubai Food Park includes a central wholesale market that serves the retail, hospitality and food service sector; a logistics area; an area for complementary services such as packing, repacking, and processing; and a dedicated area for handling packaged goods. Staff accommodation, hotels, financial services, and a centre for integrated government services and recycling organic waste, are also part of the masterplan.